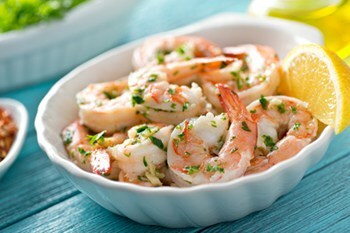 Easy Shrimp Scampi with Garlic and Lemon is one of the quickest dinners you can make. In about 12 minutes, less if your pasta is already cooked, an absolutely delicious and special meal can be on the table. Add a slice of French Bread, a green salad, and dinner is done. In a large skillet, melt the butter and olive oil. Then add the chopped garlic and sauté about 1 minute. Add the wine, red pepper flakes and salt and pepper to taste. Bring to a simmer and continue cooking about 2 minutes or until the sauce has reduced. Add the shrimp and sauté until they begin to turn pink, about 4 minutes, depending on how large they are. Stir in the parsley and lemon juice. Finally, add the cooked pasta, toss and serve.